International Association of EMTs and Paramedics. EMS union working for EMS professionals. Nominations for the offices of President, Vice President, Treasurer, Secretary and Chief Steward are now being accepted by Election Officer James Rucidlo. All nominations must be made by 12 p.m. Thursday, April 4, 2019, on Nomination Forms and Nomination Acceptance Forms provided by Election Officer Rucidlo. Forms may be downloaded from the IAEP website at http://www.iaep.org/member/information/contact-iaep or by contacting the Election Officer at 617/376-7266. Forms must be returned to Election Officer Rucidlo by 12 p.m. April 4, 2019, by mailing to James Rucidlo, IAEP, 159 Burgin Parkway, Quincy, MA, 02169; by fax to James Rucidlo, 617-472-7566; by email to jrucidlo@nage.org. Election Officer Rucidlo can be reached by phone at 617-376-7266. Nominations received after 12 p.m. April 4, 2019, will not be valid. Candidates for office must be members in good standing for one (1) year as of March 21, 2019. All members in good standing may nominate a candidate for any office. A person nominated for more than one position must select the office of his or her choice; no person may run for or hold more than one office. The term of office is three (3) years. Write-in ballots and absentee ballots will not be accepted. It is the responsibility of a member making any nomination to ensure that the Election Officer has received the nomination and that their nominee returns a Nomination Acceptance Form by April 4, 2019. If you know of any member who did not receive this Notice, please contact Election Officer Rucidlo at 617-376-7266. Ballots for the election of officers will be mailed to all members on or about April 9, 2019. To be eligible to vote, you must be a member in good standing as of April 4, 2019. Ballots will be picked up from the U.S. Post Office, located in Dunedin, Florida at 12 p.m. on Wednesday, May 1, 2019, and will be tallied immediately thereafter at the Clearwater Firefighters Association Headquarters, 831 Lakeview Road, Clearwater, Florida. In the event of a tie vote for any office, ballots to resolve the tie vote will be mailed immediately following the tally and counted on May 16, 2019. Members are welcome to attend. The IAEP is committed to provide IAEP members multiple ways to stay informed and get involved with IAEP. Whether on the local level, regionally, or nationally IAEP wants to make sure that all IAEP members have access to information pertinent to IAEP members. Don't forget to sign up for IAEP Text Messages on your cellular telephone. This is a quick and easy way to get information about pertinent and important matters that affect you. Simply text keyword IAEP to the number 72727. Text and data charges may apply. This Member Information Center is designed to provide current IAEP members with news and information in a manner that best suits you. To learn more about IAEP, simply navigate through this website. Using the Yellow buttons above, you can easily find general categories of information. Simply click on a yellow button to go to that category. To the right are Grey buttons containing specific information found within each category. You are currently in the Member Information section at IAEP.org. 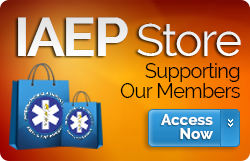 This website is divided into three easy sections, About IAEP, Why IAEP, and the Member Information Center. This section," Member Information Center" gives information about the IAEP. Why IAEP gives information to prospective new members of the IAEP. The About IAEP section gives additional information about IAEP.